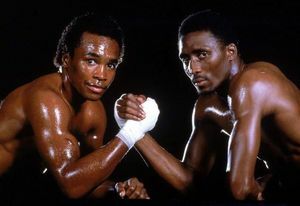 In the summer of 1981, only two boxers mattered in America: WBA welterweight champion Thomas Hearns, and WBC welterweight champion Sugar Ray Leonard. 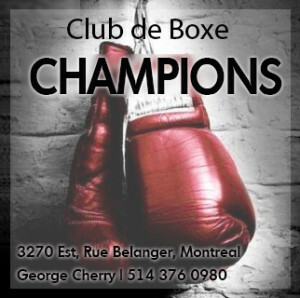 Ever since the previous fall, when both men won huge fights – Hearns knocking out Pipino Cuevas; Leonard forcing Roberto Duran to quit — this was the biggest match boxing could offer, the contest the whole world wanted to see. In 1981, it was the only fight that mattered. It was the classic confrontation: boxer vs puncher. 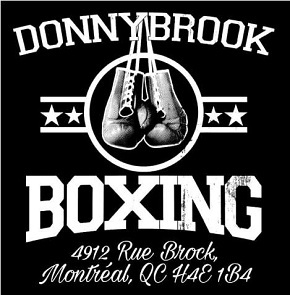 Leonard filled the former category, his fast feet and faster hands thwarting even the toughest fighters, as all saw in his rematch with the dangerous Duran. Hearns was the knockout artist, the fearsome puncher they called “The Hitman.” He boasted a thunderous right hand and 30 knockouts in 32 wins. The backgrounds and personalities of the two champions contrasted sharply as well. Sugar Ray, the Olympic gold medalist, enjoyed celebrity status, his dazzling smile selling cars and soda pop. Hearns was more stoic, soft-spoken, exuding an air of mystery and menace. A native of Detroit, his climb up the ranks, while just as fast and impressive as Leonard’s, was also more blue-collar, unaided by constant television exposure and lucrative endorsement deals. Billed as “The Showdown,” Leonard vs Hearns was finally set and few fights in boxing history aroused as much anticipation. 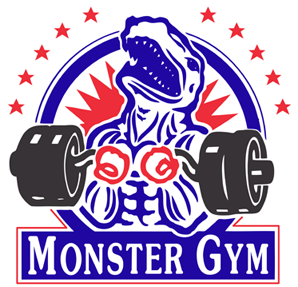 Millions crowded into closed-circuit theaters around the world while ringside seats sold for record sums. And to everyone’s delight, the bout more than lived up to the hype. Though not in ways anyone expected. Two factors no one could have anticipated defined the match: not Hearns’ punching power, but Leonard’s; not Leonard’s technical boxing ability, but Hearns’. In other words, a complete reversal of roles. 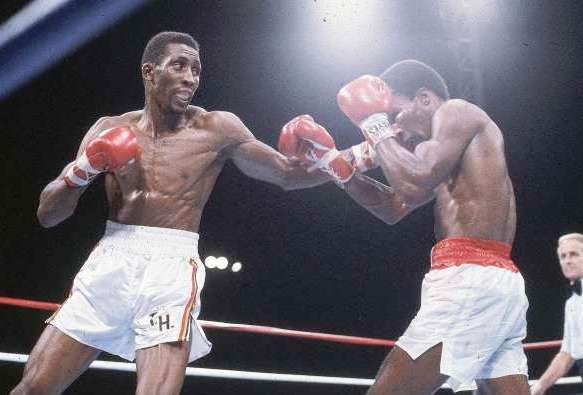 The first five rounds were razor close but belonged to Hearns, his 6’1″ height and 78″ reach allowing him to land his jab and control the tempo. Tense and fast-paced, these rounds were an exercise in suspense as everyone waited to see what might happen when the stalking “Hitman” landed his cannon-like right. 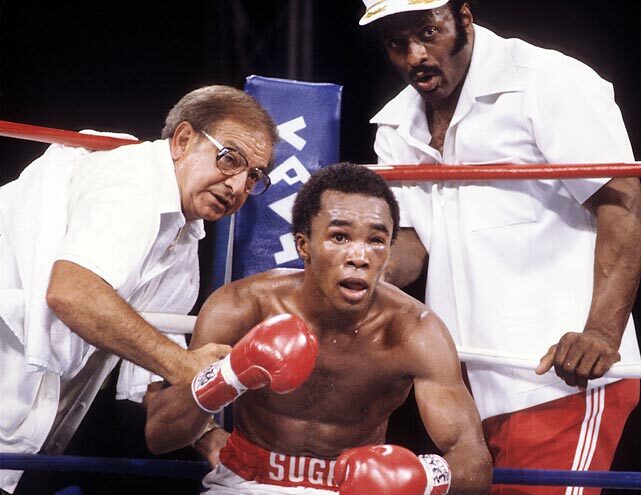 But in round six it was Sugar Ray who connected on Tommy’s chin with a hard counter left, almost flooring Hearns and changing completely the bout’s complexion. 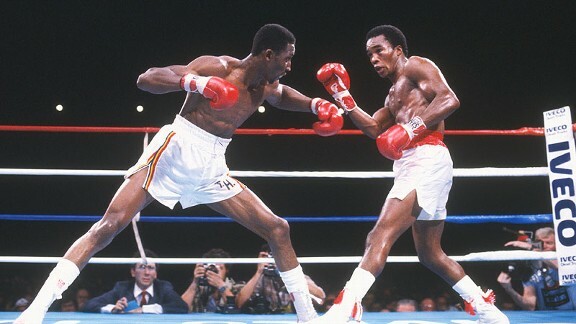 For the rest of that round, Hearns was battered with power shots, Leonard landing vicious hooks to both head and body. 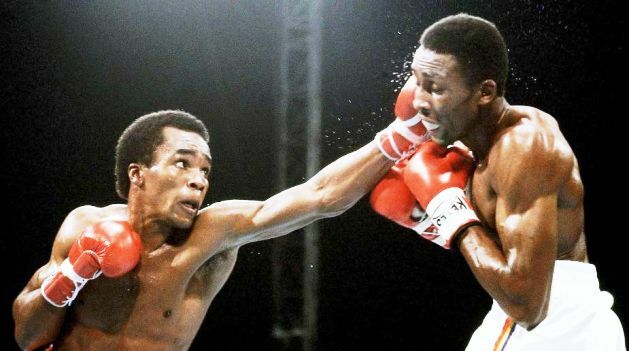 If round six was a bad dream for Hearns, the seventh was a nightmare. Now showing little respect for Tommy’s power, Leonard pursued aggressively and early in the round took a huge right from Hearns. Nothing happened. Instead, Leonard just kept coming, throwing heavy shots to the body to set up a beautiful uppercut/left hook combination that had Hearns reeling about the ring again. 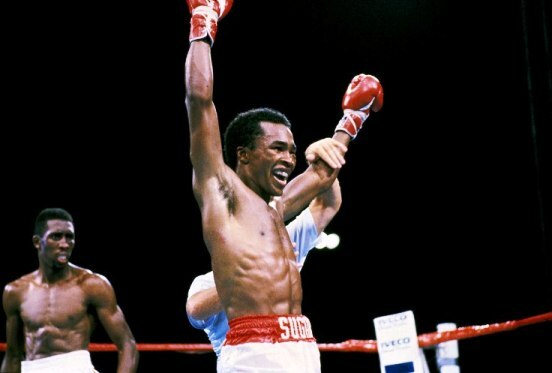 An overhand right almost put “The Hit Man” down and the crowd came to its feet as Leonard chased Hearns, pounding his opponent from corner to corner. The next three rounds were a strange sight to anyone even barely familiar with the natural styles of the two fighters. Instead of Hearns stalking, it was Leonard. Instead of Leonard dancing and moving, staying one step ahead of the dangerous puncher, it was Hearns. The surprising fact borne out by this complete reversal was that Leonard’s power, often underrated, proved just as deadly as The Hit Man’s. 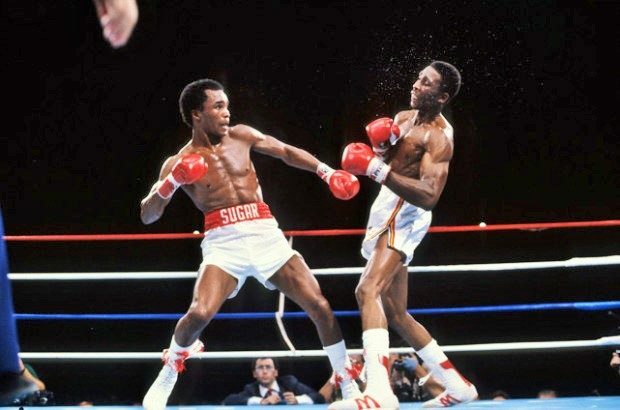 But now Sugar Ray had fallen victim to the puncher’s common mistake, looking for the one big shot instead of working the opponent and letting the knockout come naturally. Plodding after Hearns, and again having trouble getting past those long arms, Leonard allowed The Motor City Cobra, who just a few minutes ago looked finished, back into the fight. By the tenth, Tommy’s strength and confidence had fully returned and in the eleventh he took control, dictating the terms behind that long, snapping jab and finding openings for the right. Near the end of the round a right lead followed by a sharp left jolted Leonard, punctuating a round which signaled another plot twist in this unpredictable drama. In the twelfth the crowd was chanting “Tommy! Tommy!” as Hearns pursued while Leonard, his left eye badly swollen, appeared tentative, confused, his face bearing the wide-eyed look of a lost man scrutinizing a bus schedule. At the end of the round, Hearns marched confidently back to his corner while Leonard, appearing tired, trudged wearily back to his. 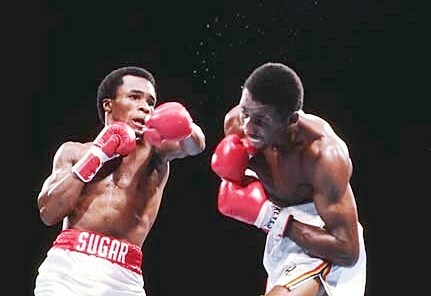 Hearns came roaring back in rounds 11 and 12. And with that, Leonard sprang from his stool to start round 13, no longer the quarry, but taking the fight to Hearns with urgency and eventually landing a crunching right hand over Tommy’s low left. 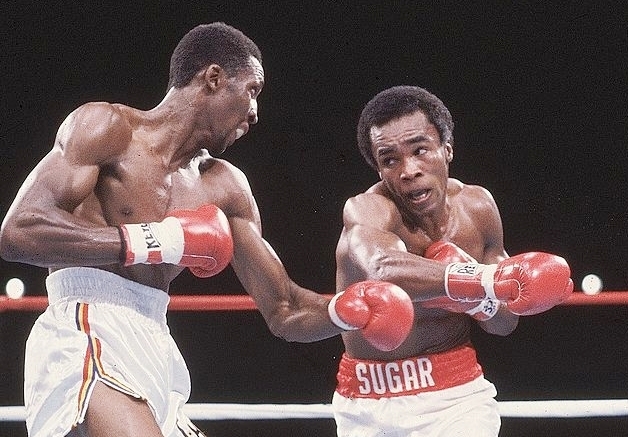 For the first time since the seventh, Hearns’ legs buckled and Sugar Ray didn’t let “The Hitman” off the hook. 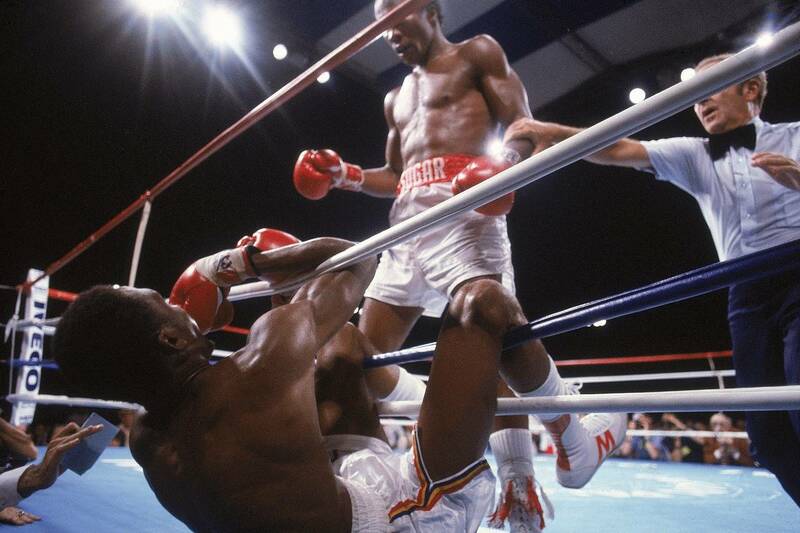 An astonishing, rapid-fire flurry of 25 unanswered punches had Hearns dazed and staggering. He fell through the ropes twice before the round ended, and it was courage alone that allowed him to survive. Leonard almost knocked Hearns out of the ring in round 13. Ray never beckoned for the referee to stop the fight..